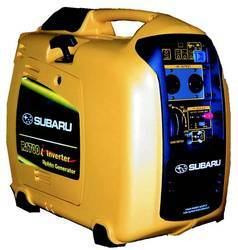 The Subaru R1700i is a 1.65kVA generator, so it's great for powering fridges, freezers, lights, TV's, radios, fans and more. Inverter technology also means you'll never be without your laptop, phone, or other sensitive equipment. Quiet operation means no angry campsite neighbours, and no headache for you! It runs on 4-stroke petrol, so no need to mix fuel. With just 1 left in store, this low price won't last long - and you won't find anywhere cheaper! December 12, 2012 Excellent machine, starts 1st pull every time. As quiet as a Honda for way less money. High quality packed with great features. Love that it has a charger for 12V batteries and an almost 7 hour run time. Would buy it for full price in a heartbeat. Run like a top.